Your home’s temperature doesn’t matter if the air isn’t comfortable. If you’ve ever felt like something was off with your HVAC system, air filtration and humidification is likely for you. Millions of allergens float around in your home all day. In fact, indoor air is often dirtier than outdoor air. This is especially true during winter. Coincidentally, winter is also the time when indoor air is the driest. Dry air aggravates sinuses, cracks your skin, and can even damage your home and furniture. Our filtration and humidification systems work together with your HVAC system to keep your air clean and comfortable. Steve’s Heating handles the distribution and installation of Trane air filtration and humidification systems. The Trane CleanEffects™ Whole Home Filtration System will remove 99.98% of airborne particles and is over 100 times more effective than any other filtration solution on the market today. The power of the CleanEffects™ system was even verified by Harvard. With more than 60 million Americans suffering from asthma and allergies, this certification acts as a beacon to signal which products have been scientifically proven to reduce exposure to asthma and allergy triggers. Trane CleanEffects™ perfectly balances between performance and efficiency. 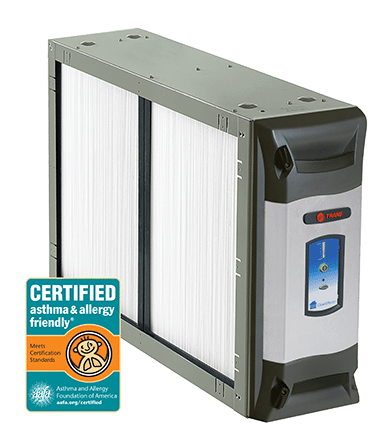 It produces much less pressure drop (a reduction in air circulation brought on by air filters getting clogged with dust) than its competitors.